Well, that was a blundering start to the Election campaign, even by the standards of the modern Conservative Party. So let me get this straight. According to Duncan Smith, the Conservatives have not yet made decisions on exactly how they are going to make the pledged cuts of twelve billion pounds to public spending, even though they announced them well over a year ago. They just have a nice, juicy-sounding target-figure to aim at, without even calculating whether it is a suitable target, and they are going to work out a budget to reach it ‘after-the-fact’? However, they have managed to calculate a budget for the Labour Party’s plans – and in such impressive detail that they can even tell us how much extra tax the average household will pay? After four hundred and fifty days of not figuring out their own budget, that may go down as a disproportionately-rigorous examination of Labour’s plans. It is always deeply satisfying to see one of the right-wing sociopath parties knocked back into a humiliating retreat, especially so quickly. Such shameless, dishonest scaremongering from Conservatives is a major issue, and entirely par-for-the-course at Election time in particular. But the secondary issue in this bears mentioning too; even if they had been making honest calculations (and do they ever?) the Tories are sidestepping their priorities and democratic duties by only commenting on Labour’s budget plans, while keeping their own – assuming they have any – under wraps. The original announcement that there would be twelve billion in spending cuts by 2018 was another that was more or less snatched out of thin air, but since then the Conservatives have still had about a year-and-a-quarter to put ‘flesh on the bones’, as it were. And yet they appear no readier to let us hear what the framework will be. The obvious assumption to make from that is that the Tories know no better than we do, as they have run out of ideas that they think people can stomach. But there is another possibility. Just assuming for a moment that the Conservatives have put together at least an outline for the next few years of cuts: Most of the cuts performed during this Parliament have done more harm than good, and the ‘economic recovery’ of the last eighteen months is fuelled by household borrowing that is almost certain to lead to another banking crash fairly early in the next Parliament. Any further cuts George Osborne will make are likely to be so savage, so draconian, so unfair, and so cruel to the most vulnerable in Britain – while also creating fresh slowdowns in the economy’s performance and forcing more desperate household borrowing – that only the most blinkered and self-absorbed Friedmanite would endorse them. And most members of the public, whatever else they might be, are not Friedmanites. So it is hardly surprising that the Tories would be reluctant to spell out what they want to do next. Whether they have a plan or not, it says a great deal about the arrogance and inflated self-importance of Cameron and his closest circle of colleagues that they see no need to explain to the country what they hope to do next. Make no mistake, these are people who see themselves as ‘above’ most of the rest of Britain, and as such, feel no compunction over lying to them, and sneer at the very thought of being ‘accountable’ to them. No, it is their innate ‘right’ to lead. It is the nature of democracy, if it is ever to work, that the public are trusted with the truth, so that they can make informed decisions on whom to trust in turn with their vote. The Conservatives will not co-operate with that ideal though. Their priority is power alone, and they rightly fear that an informed public, aware of precisely what a Tory Government would do to them, would never trust them with that power. Everyone’s favourite purveyor of reality-independent fiction, Iain Duncan Smith, Work & Pensions Secretary, was today on The Andrew Marr Conservative Party Propaganda Echo Chamber… er, I mean, The Andrew Marr Show. Characteristically, IDS simply went and declared an outright reversal of the plainest facts, when just moments into the interview, he announced, “homelessness has not risen”. But this is not so much an analysis of the BBC habitually reporting Conservative Party falsehoods as facts, so we’ll let Marr get away with it for now. Instead, let us analyse the suggestion that homelessness has not risen during the current Government. 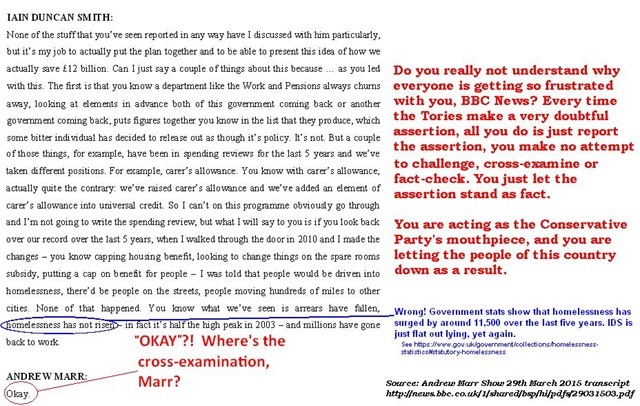 I have no doubt that most people were scratching their chins and muttering, “Oh-sure-Jimmy-Hill…” as soon as they heard it anyway, so it possibly isn’t that big a deal that Marr didn’t bother to fact-check in this instance. But it’s still worth studying the actual details, if only to appreciate the sheer degree of barefaced dishonesty IDS is routinely capable of. Most recent stats from the Government’s own figures show that, not only has homelessness risen since the Coalition Government got into power, it has surged. Approximately 53,250 families were accepted as homeless just last year, over eleven thousand more than in 2010. Crisis has concluded that the number of homeless people in England is up by roughly six per cent on the last year, indicating that new homeless cases are clearly happening far more rapidly than already-homeless people finding a place to live. And as the Johnny Void blog has pointed out only in the last month, the number of people now sleeping rough is greater than at any time since records began. IDS should be prosecuted. What he has done since taking over the DWP has literally killed and dispossessed tens of thousands of people, but his repeated lies to the nation whenever he is confronted about the holocaust he has inflicted on his own country would be classed as Perjury in a Court-of-Law. If it can be proven that he is lying – and it can – it should still be possible to prosecute him for it; I have never understood why lies with terrible consequences should not be indictable just because they are told outside a Court instead. Given people can be prosecuted in some parts of the world for denying The Holocaust in Nazi Germany, why not prosecute the instigator of a holocaust happening right now when he tries to deny it? Never mind platitudes about freedom-of-speech, or the right to an opinion. These are not matters of opinion, they are plain facts – facts he has full access to. IDS is killing tens of thousands of people, and dispossessing scores of thousands of others, and it is not his ‘opinion’ that he isn’t, it is his very primitive cover-story that he isn’t. He knows full damned well that he is devastating the lives of the poor, he takes a frightening pleasure in it, and he should not be free to pretend otherwise. There is nothing unusual about Conservative Party activists (and strategists) resorting to dirty tricks and underhand behaviour to fight elections, but it can always be a useful barometer for detecting the atmosphere within the Party; as a rule, the number of dirty tricks employed tends to be roughly proportional to the amount of fear they are experiencing. The dirtier the tricks and the more they resort to them, the more fearful they are of their main opponent defeating them. The one occasion this perhaps hasn’t been true was 1997, when then-Prime Minister John Major famously vetoed a Party Political Broadcast portraying Labour leader Tony Blair doing a deal with the Devil in order to get to 10 Downing Street. The ‘Faust video’, as it is sometimes known, was simply too much of a hatchet job, and, in Major’s own words, the Conservatives “would have deserved to lose the Election” had they gone ahead and broadcast it. Of course, so mired in arrogant corruption as they were, they deserved to lose it anyway, and at length they did so by a humiliating landslide. But in fairness to Major, he was quite right about the PPB; it would have been a scandalous personal attack, and while I realise that the idea of ‘a personal attack being too scandalous for a Tory Prime Minister’ may sound a little like a diplomat being ‘too drunk to talk to the Russians’, still, credit where it is due. But outside that almost-unique moment of conscience from a Conservative leader, the pattern has been almost frighteningly consistent since at least Edward Heath’s time. Any Labour leader who threatens the Tories at the ballot box will be threatened with character assassination and vindictive personal smears. Given that the current Labour leader is Ed Miliband, who has never cut a particularly impressive figure, nor been a particularly inspired public speaker, one might have been forgiven back in late-2010 for expecting that the Tories might keep the spiteful, close-to-cheating behaviour to a minimum for the 2015 General Election, which is now little more than a month away. Miliband has often seemed the embodiment of polite mediocrity; a leader who offends few, but inspires even fewer, and thus presents no danger to his own party or to its opponents. Surely the Tories would keep the gloves on this time? No. Instead, throughout the last few weeks in particular, the Conservative Party have been frantic, disturbingly frenzied almost, in their attempts to land blows on Miliband – perhaps literally (see the bit about Grant Shapps below). The real nastiness in the wider right wing towards Miliband seemed to begin late in 2013 with the now-notorious hatchet job by the Daily Mail on his father Ralph. Up until around that time, the right in Britain seemed to be quite relaxed about Miliband and didn’t take him all that seriously. But his endorsement of (compared to Blair at least) some quite leftist ideas during the Party Conferences seemed to meet with some approval around the country, and the hardline freaks who run the Daily Mail seemed to get quite nervous about it, choosing to attack the Labour leader through his father. By and large, the opinion piece proved to be a massive backfire, as even some Conservative figures expressed great unease at the article’s tone and inaccuracies, while the general public, clearly disgusted by such brazen dishonesty and obvious maliciousness, gave evident sympathy to Miliband. The furore also served rather to ‘blot out’ coverage of the Conservative Party Conference the following week, making the article into one of the most ill-considered smear-pieces by a right-wing tabloid since Kelvin MacKenzie decided to write the chillingly-inaccurate headline ‘The Truth’ in The Sun in April 1989. This was a bit of a turning-point for Miliband, as it perhaps brought him the confidence of knowing that he was hitting a nerve that he had been unable to get at for his first three years as the Labour Party leader. Certainly his performances against David Cameron in Prime Minister’s Questions have been getting better and more effective since that time, and that has in turn led the Conservative Party itself to get increasingly nervous. In PMQ’s, and more and more in other forums around the nation, Ed Miliband has shown that he can win the war (this is not something we should be over-impressed by, given the long catalogue of ‘open goals’ that the inept and economically-dyslexic Coalition Government has presented him with, but still, an Opposition leader has to strike when the opening is there, and too many previous ones have failed to do so, even when it should have been easy) and as a result, the Tories have started taking him a lot more seriously. So seriously in fact, that recent Tory behaviours suggest that they are now genuinely scared. Looking back a month to David Cameron’s abysmal showing at PMQs during discussion of MPs’ second jobs, in which Miliband absolutely ransacked the hapless Prime Minister without the slightest difficulty, it has become apparent that there is an air of panic setting in among leading Conservatives every time the Labour leader gets ready to speak. That seemed unthinkable just a couple of years ago, but the realisation has set in that Cameron’s superior speaking voice alone is not enough to win against Miliband after the Government has handed opponents so much ammunition to fire at it with. Miliband may never win plaudits for a resemblance to Winston Churchill as a public speaker, but he is easily intelligent enough to recognise the many issues that Cameron is vulnerable on, not least the surges in poverty and homelessness under the Coalition, and the failure of the Government to get anywhere near to their Election pledge of wiping out the Public Sector Deficit in the lifetime of the now-outgoing Parliament. From Cameron’s bizarre, obsolete recent rhetoric about Labour and Trade Unions, we can see that the Conservatives are trying to mobilise their traditional support against Miliband, by invoking stereotype visions of a country ‘held-to-ransom’ by ‘corrupt and over-powerful workers’. Cameron used that same image only this weekend in a speech to the Tories’ spring conference. The dated feel of the rhetoric was again unmistakable, but the speech was also disturbing in just how directly and personally it attacked Miliband, accusing him of leading a collection of “hypocritical, holier-than-thou, hopeless, sneering socialists” who have betrayed their traditional values. “Don’t vote for Labour while Miliband is in charge! He’s holier-than-thou!” Fine, Cameron, but does that mean we shouldn’t vote for you either when you and your colleagues grail against the largely-mythical ‘something-for-nothing’ culture among Britain’s poor, while you ignore the very real ‘everything-for-nothing’ culture of Britain’s rich? “The guy who forgot to mention the deficit could be the one in charge of our whole economy,” warns the guy who makes a big deal about (supposedly) halving the deficit during this Parliament, and forgetting that he had promised it would be wiped out completely by now. “The leader who thinks leadership is climbing aboard the latest bandwagon; he could be the one taking the make-or-break calls in the middle of the night,” says the man who has allowed the populist xenophobic rhetoric of the UK Independence Party to drag his Immigration Policy to the far right. As we can see, it is Miliband who is being personally singled out for (hypocritical) denigration, more than the Labour Party as a whole, and that means that Miliband himself has become a man to be reckoned with. He must be, for these attacks are what pass for the ‘reckoning’. The Conservatives are scared of him because they know he can beat them and are not sure that they can beat him. That is why they are desperate for the rest of the country to be scared of him too, by trying to make them think of Miliband-as-PM as the progenitor of a future socialist utopia-gone-wrong. Add to that the emerging evidence that the Conservative Party’s sociopathic Chairman, Grant Shapps, may have been employing heavies to attempt actual physical intimidation of Miliband – in the style of a feebly simplistic metaphor for a future Labour administration supposedly being ‘pushed around’ by the Scottish National Party – and we can see that the Tory dirty tricks are getting dirtier and closer to crossing-the-line than ever before. To go to the extremes of physically assaulting Miliband, albeit only in a minor way, and to a lesser extent doing arguably similar to Nigel Farage, suggests that the current Conservative Party outlook is so scared it is getting close to paranoid schizophrenia. Why would we want a PM who already has a five-year track record of abundant failure, who clearly hates his country so much that he has disowned and persecuted about eighty per cent of its inhabitants, who sells out time and again to banks and other assorted ‘Big Business’, who is still unable to win a clear majority in Parliament even when he has over three-quarters of the mainstream media – including the ex-Tory-dominated BBC – quite blatantly and shamelessly rooting for him, whose outlook seems increasingly anchored in the long-settled issues of the 1970’s, who seems perfectly open to the idea of doing deals with extremist parties such as UKIP to prop up his position in the event of another Hung Parliament, who is too lily-livered to take part as Prime Minister in exactly the types of debates he was demanding should be a regular feature of General Election campaigns when he was in Opposition, and who seems paranoid to the point of fantasy about the characteristics of an unremarkable opponent with modest public-speaking skills? I can only speak for myself of course, but looked at that way, I would take a dozen Ed Milibands as Prime Minister before I would tolerate just one David Cameron. Another aspect about some of Reeves’ remarks that has bothered me is the false *separation* between benefits claimants and workers; the false notion, that is, that if someone is on benefits, they are automatically not in work. Many are, and have to be just to get a better-than-poverty standard-of-living. Roger Helmer of UKIP whining as usual. I’ve decided – not for the first time when dealing with a ‘Kipper – to reblog his post when offering my comments, because I have no reason to expect Helmer to authorise any comments that disagree with him. Certainly, the comments thread below his post gives a very strong impression of an ‘echo chamber’. Not that I am exactly defending the people who did this, but does Helmer have any thoughts on the Britain First foam-at-the-mouths who are driving around trying to ‘protect’ Nigel Farage in a militarised land rover? So far, UKIP have sounded far less bothered by BF members roaming the streets in their name looking for a fight than they do by a rather tasteless practical joke. Except, they were not *only* ‘having a laugh’, they were making a point. Whether you agree with their point or not, they were not dressing up just for fun, which is what Prince Harry was doing back when he dressed up as a Commandante. It’s also worth pointing out that the publicity stunt was not a parody of the Nazis, it was a parody of a musical movie made in the late 1960’s. This is not to say that I agree with what they did. I am very much a believer in Godwin’s Law and I do not think the people who trigger it are doing anything sophisticated. Oh dear, here we go again. Now, at the risk of digressing, it’s worth pointing out this is itself a Godwin’s Law trigger, by making dubious comparisons between Nazis and the modern Left. But more to the point, why does it not surprise me that a pseudo-scholar like Helmer would be yet another of the fools who put those words in the mouth of Joseph Goebbels? Vile man though he was, and much as the thought of him makes my skin crawl, this unceasing quotation attributed to Goebbels is simply a red herring. There is no record whatever in Goebbels’ own time of him ever saying such a thing, and it would be completely inane if he did; a propagandist openly admitting that he is lying is not going to do a very effective job. Says a ‘Libertarian’ who is opposed to gay rights, women’s rights, and workers’ rights? Says a ‘Libertarian’ who effectively promotes turning Britain into a Christian theocracy? Says a man whose economics blogposts invariably call for the wealth of the already-wealthy to be protected and kept from redistribution, thus keeping the poor imprisoned in poverty? Says an unsophisticated Climate Change Denialist who tries to maintain and enhance the enormous power and wealth of Big Oil plutocrats by pretending he knows better than the people who actually *study* Climate Science (seriously, Helmer is so basic in his denialism that he still invokes the total bunkum idea that there has been “no warming for 18 years”, which is a claim arrived at by the most flagrant bit of cherry-picking from a graph that it doesn’t even pass as pseudo-science.) Says a member of a party whose membership, as I pointed out above, refuses to publish comments on their blogs from people who disagree with them? That is what he means by Libertarianism? (See this reply I made to Andrew Mountford AKA ‘Jez Pen’, to a falsified blogpost he had written about climate change. Helmer’s ‘cure’ for authoritarianism is as ridiculous as George Osborne’s ‘cure’ for the economic chaos of the last seven years – keep doing more of the same things that created the problems in the first place. Osborne tries to prevent a new Credit Crunch by encouraging even more excessive private borrowing, and Helmer tries to prevent authoritarianism by reinforcing established elites. The self-serving doublethink would be funny were it not for where it would lead to. I agree the stunt was a bit tasteless (although not altogether unfunny), but Helmer needs to pause and ask himself what the real reason is why his party is associated with extremism and racism. He puts it down to ‘propaganda’ by the left, but the avalanche of examples of xenophobic and racist remarks coming from members of UKIP are not just ‘made up’. The real issue, as I stated the other day, is that UKIP appeals to extremism, whether it intends to or not. And if it doesn’t want the associations that leads to, its leaders have to do more than just say, “We’re not racist.” They have to demand that racists stop supporting them and go elsewhere. UKIP’s Party Conference in Margate on February 28th was gate-crashed by a group of dancers wearing Nazi Swastikas, and accompanied by a tank. They came from Mel Brooks’ Musical Show “The Producers”. The organisers had spotted an opportunity to generate some publicity while taking a pot-shot at UKIP. Let’s pause and consider for a moment. Remember the furore when Prince Harry wore Nazi insignia to a fancy-dress party? The press (and especially the left-wing press) gave him a roasting. Or when Tory MP Aidan Burley did a similar thing in 2014? Imagine if you or I showed up in a Nazi uniform and said “But it’s just a bit of fun”. Or “We were only having a laugh”.